This is one for all you Disney fans. Styled in sterling silver and detailed with black enamel, this Flounder charm - based on the iconic Disney classic The Little Mermaid - is the perfect addition to any collectors Chamilia charm bracelet. 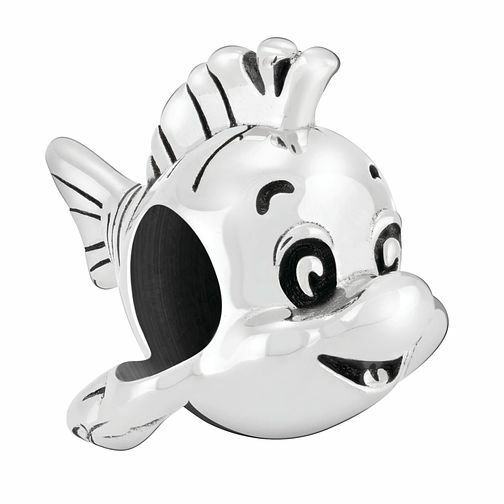 Chamilia Disney The Little Mermaid Flounder Charm is rated 4.0 out of 5 by 2. Rated 3 out of 5 by Anonymous from Lovely charm but the tail is uncomfortable I fell in love with this charm as soon as I saw it, I’m a massive little mermaid fan so knew I wanted this straight away. Only had it on my bracelet on for a day it had dug into my arm and felt so uncomfortable leaving little red marks all round my wrist. The tail is quite sharp so was returned to the shop a few days later. Rated 5 out of 5 by Anonymous from lovely cute face I had recently purchased this lovely charm along with Ariel with my £25 voucher off. I think that he has a lovely cute face and would make anyone smile if they had this lovely charm on their bracelet.